America's Civil War: The Operational Battlefield, 1861-1863 by Brian Holden Reid (Prometheus Books, 2008). This is the middle volume of planned trilogy (the last will cover the final 18 months of the war). I haven't sampled any of the author's previous work, including the study that this book follows, The Origins of the American Civil War , but I sure hope this book analyzes Civil War operational art in a meaningful way, rather than recounting well worn campaign history. Borderland Rebellion: A History of the Civil War on the Missouri-Arkansas Border by Elmo Ingenthron (The Ozarks Mountaineer, 1980). I've been searching for my own copy for quite some time. Can't say I would recommend the text, but the maps and illustrations are alone worth the price. August Valentine Kautz, USA: Biography of a Civil War General by Lawrence G. Kautz (McFarland, 2008). Kautz on Kautz. Looks okay, but the limited bibliography isn't helping my enthusiasm. Durham: "High Seas And Yankee Gunboats"
Many published Civil War diaries are fairly mundane (to put it kindly). Unless a great deal of effort is spent on the annotation, readers are often condemned to wade through a great mound of common observations simply to uncover a few useful tidbits of information. Fortunately, Roger Durham's expertly edited volume is not such a book. His is an expansive narrative history built around the diary of Georgian blockade runner James Dickson. Caught in Newark, New Jersey at the beginning of hostilities, and joined there by family friend Thomas L. Hernandez, Dickson traveled north to Nova Scotia (enduring several mishaps along the way). In Canada, the pair joined the crew of the British schooner Standard for a blockade running trip to the Georgia coast. Dickson's diary ends abruptly, just after the Standard penetrated the Union blockade only to get lost and trapped inside Georgia's Sapelo Sound. Rather than ending his own book at the same time, Durham both completes Dickson's tale and expands its scope. The second half of High Seas And Yankee Gunboats is Durham's originally researched narrative highlighting the efforts of the Standard to escape capture and unload its cargo. Coastal patrols and raids conducted by Union gunboats seeking to interdict this trade are also highlighted. Much of the blockade running during the war was performed by sail powered vessels similar to the Standard and based along coastal creeks, rivers, and sounds located some distance from major ports. Durham's directed study is a microcosm of this effort as well as the interdiction role of the U.S. Navy. The day to day struggles of the civilian population living beside these vulnerable waterways becomes apparent, along with the slavery-destroying capability of the Union navy as it penetrated these waterways. Escaping slaves often performed important service as guides and informers. Durham's study is exceptionally well stocked with photographs and maps. Modern photos of objects and places mentioned in the text and diary entries are sprinkled liberally throughout. Maps of the Georgia and Nova Scotia coastlines are included, as well as a detailed rendering of the Liberty County-North Newport River region that features so prominently in the book's latter half. The quality cloth binding just adds to the volume's already high production values. This book is a gem of an edited diary publication. Cozzens: "Shenandoah 1862: Stonewall Jackson's Valley Campaign"
Students of the 1862 Shenandoah Valley Campaign have reaped the benefits of a number of ably researched and meticulously constructed battle studies*, but the overall campaign has not received the same amount and quality of attention. The most comprehensive history to date, Robert Tanner's revised Stonewall in the Valley: Thomas J. Stonewall Jackson's Shenandoah Valley Campaign, Spring 1862 , addressed the campaign from the Confederate perspective, neglecting half the story. Happily, Peter Cozzens's new book Shenandoah 1862 successfully remedies this deficiency in the Valley Campaign literature. His is a balanced, original treatment that also exceeds all other single-volume histories in both breadth of scope and depth of detail. Cozzens begins his study with a snapshot of the war's overall strategic situation. He also provides a brief summary of the Valley's topography and the social makeup of its populace. What follows is a well executed campaign history narrative in the traditional mold. All significant maneuvers and battles, beginning with the Romney Expedition and ending with the clashes at Cross Keys and Port Republic, are recounted. Both casual readers and demanding specialists will be satisfied with the quality of the battle narratives, which are well written, fully fleshed out accounts that do not fail to keep greater strategic concerns in mind. Conceived from the point of view of both sides, Shenandoah 1862 is by far the most balanced and complete military history of the campaign to date. In support of the text are thirteen maps of an exceptional nature, ranging from theater-level strategic overviews on down to regimental-scale tactical maps. While drawings depicting operational movements between battles would have been helpful, the battle maps are sufficiently detailed in terms of major terrain features and unit positions. Cozzens's performance evaluations of the opposing generals are critical but fair, offering conventional assessments of some officers and decidedly unconventional (yet fully supported) views of others. Like Gary Ecelbarger before him, the author accords extensive coverage to the early campaign actions and decisions of Union General Frederick W. Lander, an officer of great promise whose life was tragically cut short by a lingering combat wound. Although defeated at Winchester on May 25, Nathaniel Banks receives high marks for managing his much smaller force on the retreat from Strasburg and also for his saving a mountain of supplies and equipment from capture. Likewise, General John C. Fremont, while a mediocre battlefield commander, was judged to have performed adequately operationally while under tough logistical limitations. On the Confederate side, Stonewall Jackson fulfilled the strategic goals set by his superiors, yet all too limited the scope of his victories with bungled tactical deployments. If not a popular view of this iconic Virginian, this assessment of Jackson's tactical command acumen has certainly become less controversial among historians and other informed students of his campaigns. As a Jackson subordinate, Richard Ewell did all that was asked of him, often under trying circumstances. For this study, a wide range of primary source materials were consulted, including those from manuscript repositories located across the country. The ratio of primary to secondary sources listed in the bibliography is overwhelmingly weighted toward the former. Analysis is based upon the consideration of primary evidence. My only quibble is with relative brevity of the final chapter that traces the strategic consequences of the campaign. While explicitly condemned, Lincoln's fateful decision to divert massive resources to the Shenandoah rather than reinforcing the Army of the Potomac on the Peninsula is passed over quickly, depriving the book of a critical (in this reviewer's opinion) analytical thrust. Such a discussion might have usefully critiqued the conduct of the 1862 campaign in the context of the changing nature of the war in the east and President Lincoln's capacity as commander-in-chief during the early stages of the conflict. With Shenandoah 1862, Peter Cozzens has authored yet another masterfully crafted Civil War campaign history. Readers will not find a better researched and more complete treatment of these critical early war events. There exists very little doubt this book will be considered the standard single-volume history of the 1862 Valley Campaign for use by students and professionals alike. Highly recommended. * - Ecelbarger on Kernstown and Front Royal/Winchester, Armstrong on McDowell , and Krick for the battles of Cross Keys and Port Republic . 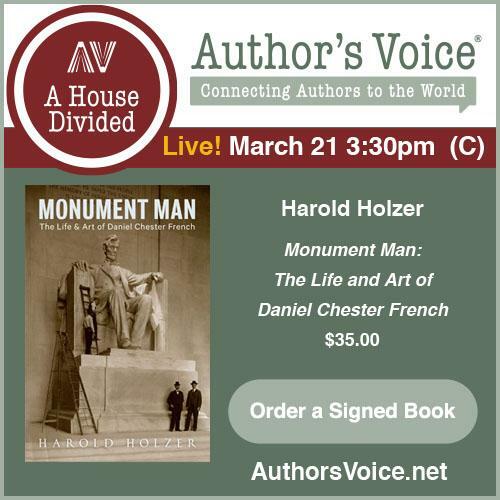 * * * * * * * * * * * * * * * *In July, I conducted an author Q&A with Mr. Cozzens, touching upon various aspects of the book. Follow the links to read Part 1 and Part 2 of the interview. This also marks the 200th book review posted on CWBA! A number of good books on the subject have surfaced recently, so I decided to revisit my reading list of recommended books dealing with the early war period in the desert Southwest, specifically the Confederate invasion of New Mexico and the U.S. government's response. The Exodus of Federal Forces from Texas, 1861 by J.J. Bowden (Eakin Press, 1986). Blood & Treasure: Confederate Empire in the Southwest by Donald S. Frazier (Texas A&M University Press). I prefer Frazier over Hall and Kerby. Distant Bugles, Distant Drums: The Union Response to the Confederate Invasion of New Mexico by Flint Whitlock. (University Press of Colorado, 2006). Confederate Pathway to the Pacific: Major Sherod Hunter and Arizona Territory, C.S.A by L. Boyd Finch (Arizona Hist. Society, 1996). 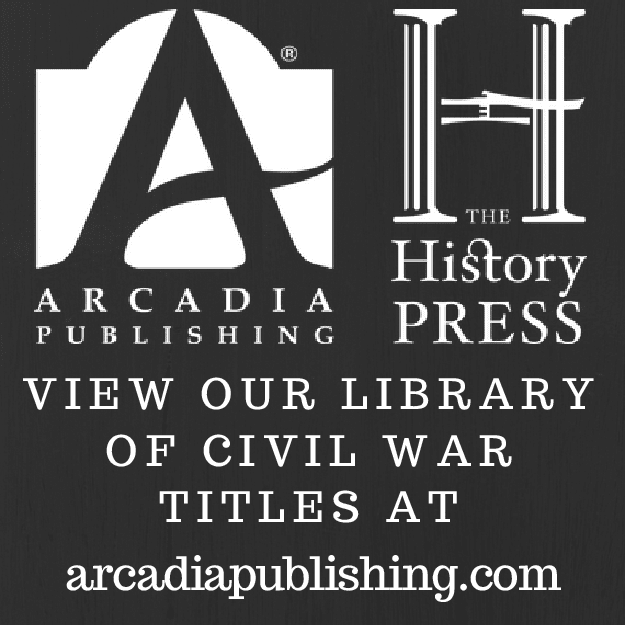 The Civil War in Arizona: The Story of the California Volunteers, 1861-1865 by Andrew E. Masich (University of Oklahoma Press, 2006). Bloody Valverde: A Civil War Battle on the Rio Grande, February 21, 1862 by John M. Taylor (Univ. of New Mexico Press, 1995). The Battle of Glorieta: Union Victory in the West (Texas A&m University Military History Series , No 61) by Don Alberts (Texas A&M Univ. Press, 1998). See also - The Battle of Glorieta Pass: A Gettysburg in the West, March 26-28, 1862 by Thomas S. Edrington and John M. Taylor (Univ. of New Mexico Press, 1998). New Mexico Territory during the Civil War: Wallen and Evans Inspection Reports, 1862-1863 ed. by Jerry D. Thompson (Univ. of New Mexico Press, 2008). Civil War in the Southwest: Recollections of the Sibley Brigade ed. by Jerry D. Thompson (Texas A&M University Press, 2001). The Civil War in West Texas and New Mexico: The Lost Letterbook of Brigadier General Henry Hopkins Sibley eds. Thompson and Wilson (Texas Western Press, 2001). When the Texans Came: Missing Records from the Civil War in the Southwest, 1861-1862 by John P. Wilson (University of New Mexico Press, 2001). Rebels on the Rio Grande: The Civil War Journals of A.B. Peticolas ed. by Don E. Alberts (University of New Mexico Press, 1984). Vanishing Footprints: The Twenty-Second Iowa Volunteer Infantry in the Civil War by Samuel D. Pryce and edited by Jeffry C. Burden (The Camp Pope Bookshop, 2008). Beginning life as a massive unpublished manuscript penned by unit veteran Pryce, this history of the 22nd Iowa has been streamlined and edited by Burden. The unit itself had an interesting wartime odyssey, including stops in Missouri, Mississippi, Texas, Georgia, and Virginia. 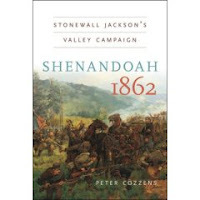 Shenandoah 1862: Stonewall Jackson's Valley Campaign by Peter Cozzens (Univ. of North Carolina Press, 2008). Advance copy in hand, I interviewed the author in July [first of two parts here]. With the recent arrival of the retail version, the book review is now complete and will be posted after the official release date (August 22). Allatoona Pass: A Needless Effusion of Blood by William R. Scaife (Etowah County Historical Society, 1995). In terms of terrain and troop movement detail, the depth and beauty of Scaife's maps are difficult to beat; but then again few even try. What the experts think of the accuracy of the author's cartographic work I have no idea, but I haven't heard any big complaints. "The Iowa Northern Border Brigade"
The Iowa Northern Border Brigade (INBB) was a state militia unit formed in the immediate aftermath of the 1862 Dakota uprising in Minnesota [a subject of several previous posts - here, here, and here about various books covering it]. Far from a true brigade-sized organization, the INBB was composed of a handful of understrength companies that patrolled the NW Iowa frontier. The men also built and garrisoned a chain of fortifications that began near Sioux City and stretched in a roughly northeastern pattern all the way to the Iowa-Minnesota border. The government sponsored monograph The Iowa Northern Border Brigade by Marshall McKusick (Office of the State Archaeologist, 1976) is part unit history, part archaeological report. While data and analysis are not at the depth found in the best of today's unit studies, this three decades old book does address issues of personnel makeup, logistics, armament, and operations to a mostly satisfying degree. While the text itself is marred by poor editing, the flaws of presentation are redeemed by the amount of information presented about this near unknown Civil War mounted organization. McKusick's lengthy, minutely detailed descriptions of the forts lining the INBB's patrol area, along with the large number of photographs and maps, engineering drawings, and illustrations of these posts, increase the value of his study for the collector and esoteric obsessed Civil War reader. I liked it, others may not! ed. Reinhart: "August Willich's Gallant Dutchmen: Civil War Letters from the 32nd Indiana Infantry"
By author Joseph Reinhart's count, only fifteen book-length diary or letter collections written by German-American Civil War soldiers have been published. His own latest book, August Willich's Gallant Dutchmen, is a worthy addition to this growing body of Civil War literature dealing with the ethnic soldiers of the Union army. While the great majority of Germans that served in the war were not members of ethnic regiments, the 32nd Indiana was clearly a "pure" German regiment. In his insightful introduction, Reinhart revives the debate over the issue of delayed German-American assimilation, a situation exacerbated by real and perceived wartime nativist prejudice. His research uncovered little evidence to support the once influential idea that the war acted as a prime mover in accelerating the cultural integration of Germans into mainstream American society. Conversely, the author finds more compelling the work of historians such as Christian Keller [see my review of his recent book Chancellorsville and the Germans] and Stephen Engle, both of whom have advanced the thesis that the war actually delayed assimilation. However, like those two historians, Reinhart takes the very reasonable and judicious tack that the available evidence is far from overwhelming and more research is needed on the cultural front. August Willich's Gallant Dutchmen contains 60 letters (edited and translated by Reinhart) from eleven soldier-correspondents, all originally published in German-language newspapers1. Some official battle reports are also transcribed and inserted where appropriate. Each passage is fully annotated by Reinhart, who also penned useful narrative passages that serve to smooth the transition (chronologically, geographically, etc.) between the various letters written by numerous authors and also to correct errors. It's all quite well done. Battles and campaigns covered include Rowlett's Station, Shiloh, Corinth, Murfreesboro, Tullahoma, Chickamauga, Missionary Ridge, and Pickett's Mill. In terms of those that shed more light on engagements with comparatively scant attention in the literature, eight letters are devoted to the 1861 battle at Rowlett's Station (KY), the positive result of which led to some renown for the 32nd. A company-level terrain and troop position map of this small fight is included as well. These letters give readers rare insight into Union movements within Kentucky during the first year of the war. Reinhart duly notes that the correspondence fairly bursts with ethnic pride, often excessively so. As with many of the quoted passages in the aforementioned work by Keller dealing with German units from the eastern states, these feelings of military superiority over native-born American units were widespread, and certainly not conducive to harmonious cooperation. This, and hypersensitivity to perceived slights2, did little to promote cultural understanding. August Willich's Gallant Dutchmen is a particularly valuable collection of letters from Indiana's German soldiers. Well constructed in durable cloth, the book also has more maps and illustrations than the typical letter compilation. A number of appendices3 are included, as well as detailed footnotes. A bibliographic essay rounds out this fine study. Beyond providing insights into the German political, cultural, and military perspective of the Union war effort, and details of battles fought, the letters also highlight the importance of German-language newspapers to the soldiers in the field, supporting the efforts of the fighting men, combating nativist slights in the mainstream press, and highlighting the achievements of ethnic regiments. Recommended. 1 - Louisville Anzeiger, Cincinnati Volksfreund, and Freie Presse von Indiana. 2 - Reinhart uses the term "victimization complex" (pg. 21) to describe the feeling, common to many ethnic units, that every distasteful assignment or misfortune was due solely to prejudice. 3 - Appendix (A) - Officer and color sergeant list by company; (B) - Brief history of the Cave Hill National Cemetery monument to the 32nd; and (C) - Source list of German diaries and letters published in English. The National Park Service's History website has a wonderful sub-section (Park Histories) full of official reports of various types, many of interest to the Civil War reader and freely downloadable in .pdf format. It's definitely a bookmark worthy site. I browsed through Jerome A. Greene's mammoth The Defense of New Orleans, 1718-1900: Special History Study (1982) [it's about a 22 MB download at 600+ pages], and found a ton of Civil War-related maps, drawings, and other material (thanks, Art!). 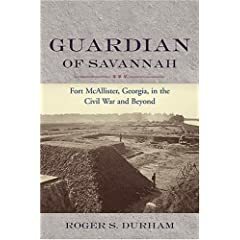 Guardian of Savannah: Fort McAllister, Georgia, in the Civil War and Beyond (Studies in Maritime History series) by Roger S. Durham (Univ. of South Carolina Press, 2008). 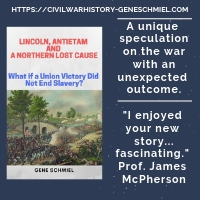 Having read Livingston's Among the Best Men the South Could Boast, The Fall of Fort McAllister, December 13, 1864 (see brief review) and Christman's Undaunted: The History of Fort McAllister, Georgia , and found them unsatisfying for one reason or another (esp. the former, but the latter is a fairly good military overview), I've been awaiting with interest this new study. The literature of the Civil War in the southwest tends to dry up after the end of the Sibley expedition. This book, under Thompson's knowledgeable oversight, should prove to be informative and one for the Trans-Miss. reference library. High Seas And Yankee Gunboats: A Blockade-Running Adventure From The Diary Of James Dickson by Roger S. Durham (Univ. of South Carolina Press, 2005). The border conflict in the Rio Grande Valley in the years during and surrounding the Civil War has received some scholarly publishing attention in the fairly recent past. Jerry Thompson has edited or written several works in addition to this one*, James Irby penned a fine overall (albeit much older) introductory pamphlet, and two accounts of the Palmito Ranch battle have been published since 2001. 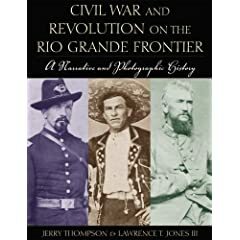 Co-authored by Jerry Thompson and Lawrence Jones, Civil War & Revolution On The Rio Grande Frontier is a particularly notable contribution to the region's Civil War literature. By concentrating on events south of the border, and stretching its focus past the war years, the study provides readers with a broader sense of the impact of the war upon future U.S.-Mexico relations. Presented by individuals with well regarded expertise on the subject matter, the narrative history and photographic study Civil War & Revolution On The Rio Grande Frontier was a winner of the A.M. Pate Award. The first few chapters, covering the Civil War years, lean heavily upon Thompson's earlier work mentioned above (and below in the notes). Military, social, and economic facets of the border situation are addressed. Not surprisingly, given the author's previous research interests, significant attention is paid to people and events south of the border, an area fraught with brutal collisions between contending Imperial and Juarista forces. Cross border raids led by men of pliant loyalties such as Juan Cortina are also discussed in some detail. Confederate political and military** efforts at maintaining the lucrative cotton trade and ensuring a steady flow of supplies are also outlined. On the Union side, attempts by the Federal government to recruit Texas unionists and thwart Imperial designs on the border region are chronicled. Special attention is paid to the officers and men of Mexican ancestry that supported each side, often with complex (and shifting) loyalties and motivations of an exclusively local nature. The photographic element of the study is an important aspect of its overall impact. Most of the 125+ images (many from the [co-author] Lawrence T. Jones III collection) have never been published before. The reproductions are crisp and large. Taken together, the photo collection comprises a wonderfully rounded depiction of people and place. Exceedingly rare images of the dusty streets of Brownsville, Matamoros, and Bagdad are includes as well as a broadly inclusive array of individual photos [water carriers, bandits, Civil War officers, Imperialistas, Juaristas, merchants, and other civilian inhabitants of the region] As with many image studies, biographical information about the photographers is included. Many of the best photographs were the work of Louis de Planque and his associates. The turbulent post-Civil War years are discussed from perspectives of individuals on both sides of border (including Reconstruction Texas), but the primary emphasis is on the continuing struggle in Mexico between the Liberal and Imperial forces. The narrative centers around the fight to control Brownsville and the internal squabbles between rival Juarista chieftains. The impact of the great hurricane of October 7, 1867 [a terrible event, the physical aftermath of which was dutifully photographed by de Planque] is also chronicled in detail. The book itself is a large (quarto) format publication, with quality glossy pages, thread binding, and cloth boards. Illustrations are first rate. However, while a handful of maps were included, a few more tracing military movements and depicting valley places and landmarks in more detail would have been very helpful to the non-resident reader. As a broadly inclusive overview of a decade of border strife, Civil War & Revolution On The Rio Grande Frontier will appeal to a variety of readerships. Students of U.S.-Mexican relations, the Civil War in the Trans-Mississippi, and the the wartime cross-border trade will find much useful information. Likewise, Civil War photography enthusiasts will gain an invaluable volume for their collections. Highly recommended. Vaqueros in Blue and Gray . Juan Cortina and the Texas-Mexico Frontier 1859-1877 . Fifty Miles and a Fight: Major Samuel Peter Heintzelman's Journal of Texas and the Cortina War . Mexican Texans in the Union Army . ** - Confederate military leaders with prominent roles in the study include men like John S. "Rip" Ford, James Slaughter, and the Benavides family. Rare photographs of Slaughter and his staff are included as well. A short while back, I reviewed Dale Cox's latest book, The Battle of Massard Prairie. The author has announced the release of a new hardcover edition. Follow this link to Cox's Arkansas blog for more information on how to obtain a copy. Smith: "The Stone's River Campaign 26 December 1862 - 5 January 1863: The Union Army"
Normal standards of just what constitutes a "detailed" battle history provide an inadequate frame of reference for assessing Mr. Smith's monumental publishing effort for this battle. I have no reservations whatsoever in declaring that there is nothing like The Stone's River Campaign: 26 December 1862 - 5 January 1863 (Vol. 1, The Union Army) in the Civil War literature. Beginning with the Union army's march from Nashville, and ending with the skirmishes fought during the Confederate withdrawal from the battlefield of Stones River, Mr. Smith provides the reader with a regimental scale microtactical history of each clash that took place during his book's twelve days of campaign coverage, from outpost skirmishes and delaying actions to the climactic multi-day battle near Murfreesboro, Tennessee. The sole focus of The Stone's River Campaign is on a straightforward rendering of the Federal troop movements resulting from the operational and tactical decision making of Army of the Cumberland commander William S. Rosecrans and his subordinates. As such, critical analysis of events and decisions, along with a broader examination of the salient considerations of war & society, are not part of this study. Loosely similar to D.W. Reed's classic Shiloh study, Smith's narrative is tightly structured by command level and chronology. The operational section of the campaign is divided into day and night headings for each 24-hour period preceding the main battle, which are further broken down into army, corps, division, and brigade subsections. For the portion of the book dedicated to the Battle of Stones River, further subheadings for individual batteries and regiments are added. In describing the combat, particular attention is paid to terrain considerations. It's clear the author is intimately familiar with the ground. The sheer volume of information contained in this volume is astounding. Considering the book's large dimensions and relatively small print size, it's 723 pages are easily comparable to a more typical trim size of twice the length. Perusing the notes, the reader will see that the O.R. forms the backbone of Smith's narrative. He's also integrated approximately 100 diary and letter collections (mostly gleaned from the battlefield park archives) into his account. Other sources used include newspapers, unit histories, and other published materials. In support of the text are 46 hand drawn maps, mostly regiment and brigade scale tactical renderings of the Stone's River battle. Emphasizing content over artistic style, the cartography is quite good. Nevertheless, a few more maps tracing the army's operational movements in more detail would have been helpful. Like most self-published efforts, the book could benefit from the oversight of a professional editor, but the information is presented quite well overall, better than many of today's traditionally published works. In terms of material quality, the binding and blue cloth boards are more than sufficient to support the book's great weight; ensuring many years of repeat reading and consultation. Supplementing the main text is a full order of battle for the Union army. While regimental strength numbers for the battle are not included in the appendix, they can be found in the unit subsections in the main text. Casualty tables and an index round out the volume. The casual reader will likely balk at the magnitude of information provided by Lanny Smith's minute accounting in The Stone's River Campaign. However, all serious students of the battle must find a place for this book in their libraries. Mr. Smith's labor of love, and it must be one, is a unique endeavor, a fitting tribute to those that fought in this terrible battle and a truly invaluable reference for specialists to treasure. * - a Confederate army volume is to follow, at a currently undetermined date. If you'd like to examine the Union army volume before buying, copies are available (the print run is limited to 330) at the Stones River National Battlefield park bookstore.